Drums are shipped by FedEx Freight once per week (usually Tuesday or Thursdays). We will get a shipping quote and contact you regarding shipping price and requirements for handling the drum (such as the need for a lift gate, pallet, etc.). Bulk pricing at $75/gal. Call ahead before ordering a drum. This size is special order and limited. Product is packaged in a 55 gallon steel, phenolic lined drum with standard 2" and 3/4" bung openings. 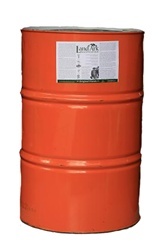 Shipping on drums is arranged with a Freight carrier and ships as soon as we can get a truck into our location. The rate quote can't accurately be generated on this site, so it will give you a very high rate with FedEx Ground. Just click it anyway and we will adjust the price down once we get the correct shipping rate for you and contact you with the real cost. Ship time is 1 week to fulfill drums orders.